Have you ever learned a new word in a different language and wondered how on earth you would translate it into English? Have you then started to doubt your translation skills, thinking that you no longer even know your own language very well? Well… fear not! In every language there are words which are ‘untranslatable’, meaning that they cannot be translated into another language using just a single word. Often, the reason for a word’s ‘untranslatable-ness’ is rooted in the cultural differences between the speakers of each language, as some cultural concepts which exist in the Spanish-speaking world simply don’t exist in the English-speaking world, for example. In this article, we’re focusing on Spanish words which can’t be translated easily into English, although some of them do have direct equivalents in other languages, such as French or Italian. All of the words on the list are used relatively frequently in conversation, so listen out for them next time you’re practising your Spanish. You might even come across some of them in an episode of Coffee Break Spanish! ¿Estamos listos? ¡Vamos! Familiar with the feeling when you’ve bought a new outfit and can’t wait to wear it? Well, fashion-conscious Spanish-speakers have a single word to perfectly describe the 11-worded English equivalent “to wear a new item of clothing for the first time”: estrenar. Meaning: To wear something for the first time / to use something for the first time. In context: Esta noche voy a estrenar el vestido azul que compré ayer. Translation: I’m going to wear the blue dress I bought yesterday for the first time tonight. Everyone who has visited Spain will be familiar with the concept of going out for tapas. While in English we say “to go out for tapas” or simply “to have tapas”, in Spain it’s more common to hear the phrase ir de tapas – literally “to go of tapas”. For example: vamos de tapas con José y Lucía esta noche. 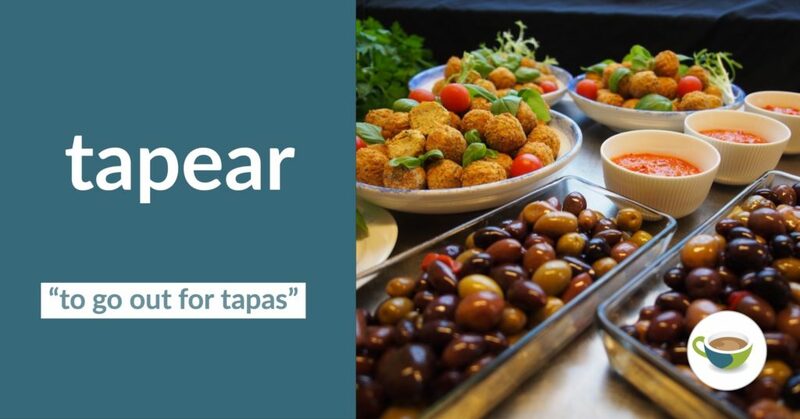 However, if this phrase is too much of a mouthful (excuse the pun), the Spanish have a verb to describe the activity of going out to eat tapas: tapear. In context: Este bar es uno de los mejores para tapear en Granada. Translation: This bar is one of the best bars to go out for tapas in Granada. Although this next word does have a direct equivalent in French (quinzaine), the closest word we have in English is “fortnight” or “two weeks”. Meaning: A period of 15 days, sometimes used in reference to the working calendar, as people are often paid bi-monthly in Spain. Commonly used to talk about the first or the second half of a particular month. Context: En la primera quincena de julio llega la feria al pueblo. Translation: The festival comes to town in the the first fortnight of July. Are you one of those people who always seems to be shivering while everyone around you is complaining about the heat and opening all the windows in the house? In Spanish, the words friolero/a and friolento/a are used to describe those who feel the cold more than others. Meaning: Somebody who gets cold very easily. In context: Javi es muy friolero, prefiere el verano al invierno. Translation: Javi really feels the cold; he prefers summer to winter. 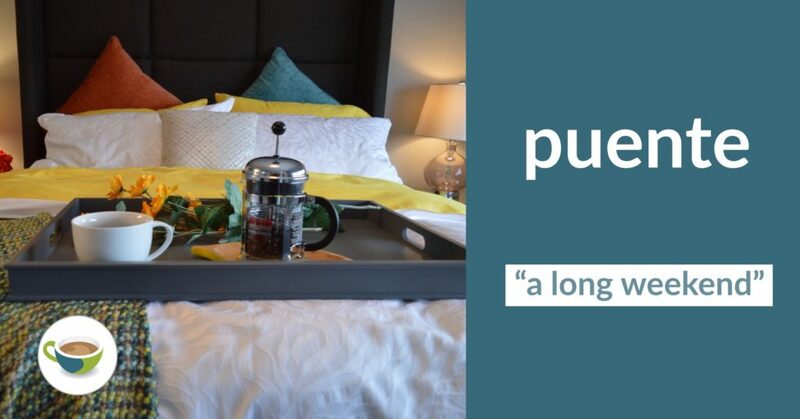 You may have come across the literal meaning of the word puente before (bridge), but puente is also used in another very common context. Meaning: A special type of long weekend, when a holiday falls on a Thursday or a Tuesday so you only need to take off one extra day off work to turn it into a four-day weekend, thus “bridging” the gap from Thursday to Monday, for example. In context: ¿Qué haces el puente de Mayo? Yo me quedo en casa, las vacaciones son para descansar. Translation: What are you doing during the long weekend in May? I’m staying at home, holidays are for relaxing. Out of all of the words on this list, soler is probably the most commonly-used in everyday conversational Spanish. To describe habitual actions in English, we tend to use the structure “subject + usually + verb (infinitive)”, but in Spanish, we use the structure “soler (conjugated) + secondary verb (infinitive)”. Take a look at the example below to get your head around this unusual grammatical structure. In context: Suelo ir de vacaciones en junio. Translation: I usually go to the beach in June. This one will come in useful for those of you who have a common first name! Meaning: Somebody who has the same name as you / your ‘name-twin’, or namesake. In Context: Me confundes con otra Elena, es mi tocaya. Translation: You’re getting me mixed up with the other Elena, we have the same name. Ever wondered what that little space in between your eyebrows is called? No? Well, the Spanish clearly have, as they have a word to describe it! Meaning: The space between one’s eyebrows. In context: Pablo tiene muchas arrugas en el entrecejo. Translation: Pablo has lots of wrinkles between his eyebrows. El almuerzo is a light snack eaten between breakfast and lunch, and almorzar is its verb form. Some people think of el almuerzo as “lunch”, but when you consider that the main meal in the middle of the day in Spain rarely starts before 2:30 or 3:00, you’ll understand the need for almuerzo. Meaning: Similar to ‘elevenses’ in the U.K. In context: Almuerzo cada día sobre las 11 de la mañana. Translation: I have a snack every day at about 11am. This may be one of the most well-known words on our list, as it refers to an inherent aspect of Spanish culture: the act of taking the time to sit around the table after a meal, talking to the people you’ve shared it with and enjoying each other’s company. 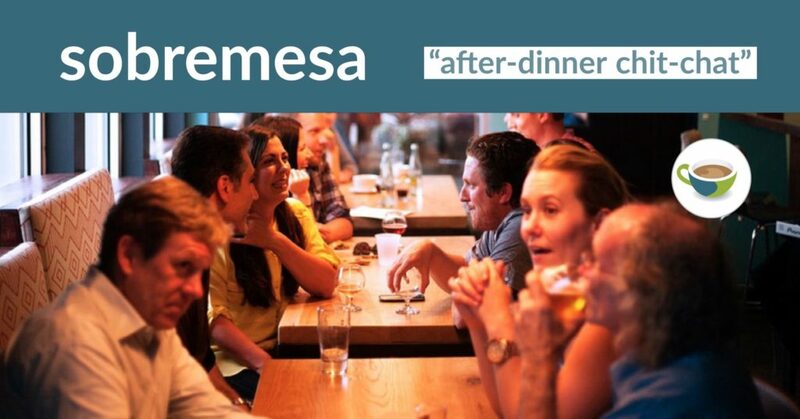 Meaning: The after-dinner chit-chat people share whilst still sat at the table. It can also literally mean “tablecloth”. In context: Mientras los padres hacen sobremesa, los niños juegan en el parque de juegos. Translation: While the parents take some time to chat at the table after eating, the children play in the playground. 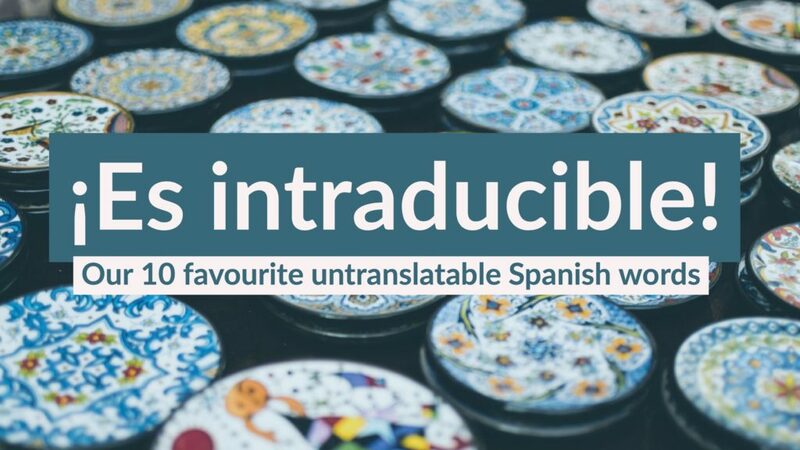 We hope this list of ‘untranslatable’ words will help you on your way to sounding more Spanish in conversation! Remember that these words may vary from country to country in the Spanish-speaking world, so it’s always a good idea to read up on a country before visiting, just to ensure you’re saying the right thing! Let us know what you thought of this article in the comments section below. ¡Hasta la próxima! In German, there is a word corresponding to “puente” for a long weekend: if Thursday or Tuesday are a public holiday, the day inbetween (Monday or Friday) is called “Brückentag”, which literally means “bridge day”. Good to know Jan! Hope you enjoyed the article. Brilliant article. Loved every word and that’s what makes the study of languages so wonderful. I’m sure my wife wife invented “estrenar”. Gracias John, we’re glad to hear that you enjoyed the article! Glad to hear that you found the article useful! There is a word for friolero in English – “nesh”. It may be a northern English word – I know because I suffer from it!